Being the oldest inhabited Castle in Ireland we draw inspiration from tradition to provide you with the noblest of modern comforts and service in a breathtaking setting. Our castle is steeped in history, and now, refurbished with all the luxuries of the modern world is a premier setting for any occasion - the perfect combination of past grandeur with the pleasures of today. Kilkea Castle is now available for your exclusive use for weddings, corporate events and family occasions. Our Castle will become yours and our team will ensure that your every need is met. Since opening its doors in 1180 it has hosted lavish banquets to medieval feasts and nowadays is the perfect venue for a fairytale wedding. From it’s founding by Sir Walter de Riddlesford in the twelfth century, through the Norman invasion, recurrent wars & changing family fortunes this noble castle survives, and to this day enchants and delights all those who enter therein. Kilkea Castle is set amidst 100 acres of woodland, manicured gardens and an 18 hole golf course, with views over the Killeshin hills and Kildare countryside. The castle boasts 35 guest rooms, including suites. Each room is unique, a step back in time but with all the luxuries of the modern world included. Kilkea Castle is now available for private hire, allowing you exclusive use of all 35 bedrooms including the suites, our bars, restaurants, receptions rooms and of course our medieval gardens. Kilkea Castle your very own Private Castle for your Special Day…. Nestled in a verdant landscape in South Kildare, we think you’ll be hard-pressed to find a setting as glorious as Kilkea Castle for your special day. But weddings here go beyond just the breathtaking environment. The attention to detail of our professional wedding team will ensure that your day unfolds exactly as you dreamt of – no fuss, just pleasure. Kilkea Castle will be your exclusive wedding venue on your wedding day. Catering for only one wedding per day you will have exclusive use of all 35 bedrooms including the suites, our bars, restaurants, receptions rooms and of course our medieval gardens for your photography. 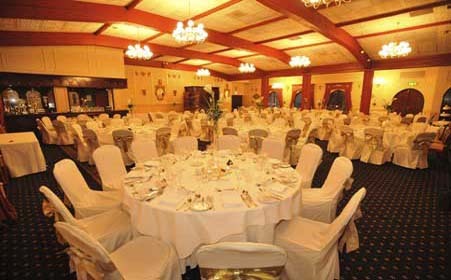 Choose from our Baronial Suite catering for up to 200 guests, to an intimate setting in our Kildare room or De’Lacy’s restaurant catering for 30/70 guests. We at Kilkea Castle are very proud of our reputation for ensuring that each and every wedding we cater for is an occasion to remember. Our professional team will assist you every step of the way to your perfect reception and will offer advice and recommendations on every aspect from cars to make up, churches to bands and everything in between. Flexibility is key to the success of Kilkea Castle, your day will run at the times that suit you and your guests best. Download our wedding pack from our home page, or contact our team now to request a wedding pack and to design and book your perfect day. Kilkea Castle can now offer this private castle for your exclusive use, share your special moments, occasions and memories within this magical historical ambience. In our modern world privacy is a priceless commodity, here at Kilkea Castle we guarantee privacy, discretion and style. Throw a party, arrange a corporate team meeting with a difference or host a family gathering. This 12th Century Castle will be exclusively yours including all 35 bedrooms, private bars and a restaurant for you and your guests only. You will also have access to our site leisure facilities including swimming pool, saunas, Jacuzzi, steam room and fully equipped gymnasium. Kilkea Castle was built in 1180 and is the oldest continuously inhabited castle in Ireland. The immediate builder and the first occupier was one Sir Walter de Riddlesford, a young knight who had accompanied the first invasion party of Anglo/Normans in 1170. From his name he was probably of Anglo/Saxon, rather than Norman stock, but was reputed to be a relation of the King’s. Apart from building Kilkea, he played no other prominent part in history and the family in fact died out in the third generation. The guest rooms at Kilkea Castle have been fully refurbished to afford our guests the highest standards of modern comfort with all the charm and elegance of the 12th Century Norman Castle. Rich, restful colour schemes have been chosen to compliment the period charm of the hotel and serve to enhance the individual design of each room. The hotel comprises of 35 individually appointed bedrooms, 11 of which are in the main castle building. Castle Rooms are all individually designed around the 12th century castle structure. Features including high ceilings, stone arches and views of the surrounding golf course and gardens are available from our deluxe castle rooms. Our Bridal Suite situated on the 3rd floor of the castle features a traditional 4 poster bed, sitting room & a bathroom built in the old castle turret. Private dining rooms available for all your occasions with capacity from an intimate setting of 50 guest in our Kildare Room to the lavish surroundings of our Baronial Suite which has capacity for up to 200 guests. Fine Dining is available at De-Lacy’s restaurant offering a blend of traditional and contemporary cuisine with menus emphasising fresh, locally-sourced foods and dishes which are carefully prepared and artistically presented. Relax in this elegant restaurant overlooking the magnificent Gardens and Kildare countryside. Our Kildare Room is the ideal setting for an intimate gathering, Civil Ceremony or Blessing. Seating capacity for 50 guests. A blazing fire awaits you and your guests to relax with a drink from our bar, our dedicated staff will ensure that you shall want for nothing. Our larger bar can be used to cater for intimate events to retire to after dinner in the Kildare Room. This relaxed bar can cater for birthday parties, corporate nights out, family reunion, the list is endless. There is a small dance floor in the bar, and Kilkea can arrange for a DJ to play for the night.